Foster Lawn and Garden in Minesing, Ontario has been Simcoe and Barrie’s trusted source for all lawn care, property maintenance and landscaping needs for over 20 years. For those who have experienced a Canadian winter, they know it can be brutal. The subzero temperatures and the mountains of snow can make for unsafe and uncomfortable conditions. Getting a green and weed-free lawn takes a lot of work and preparation and to have one come summertime, you need to get started early. The team at Foster Lawn & Garden in Minesing, Ontario understands that homeowners are finding it difficult to find the right maintenance products that will keep their lawns healthy. This is especially true since pesticides were banned in Ontario. Burnt out lawns can be an eyesore. You know the ones; they have areas of dry, dead, brown grass that shows signs of lawn care neglect. Preventing burnouts can be troublesome, however. Emerald Ash Borer Tree Damage? 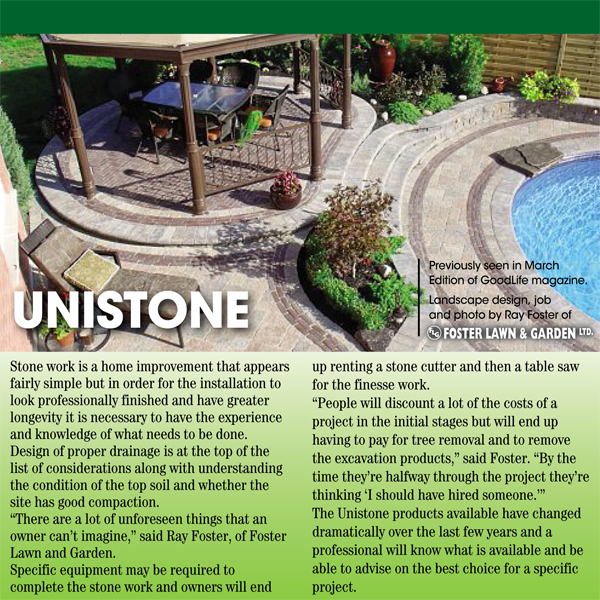 Foster Lawn and Garden in Simcoe is passionate about creating dream landscapes. It saddens us to learn that the invasive species of green beetles known as Emerald Ash Borer (EAB) are killing many ash trees in Canada. We are fast approaching another summer season and Foster Lawn and Garden in Barrie suggests a schedule of lawn maintenance that will keep your yard healthy and beautiful throughout the summer months. Foster Lawn and Garden in Minesing, Ontario, started as a small grass cutting service in 1992 and has grown into a full service landscaping and gardening company that is dedicated to serving and meeting all of their customers’ needs with 100 per cent satisfaction. Designing and planting a new garden can be an overwhelming and costly project. The landscape experts at Foster Lawn and Garden can help, whether you are adding a privacy hedge, trees, or flowers. Although grass goes dormant during the winter and needs to be mowed far less in the fall, you still need to provide care for it to ensure a green healthy lawn in the spring. During the fall months Foster Lawn and Garden can help with cleanup of your lawn and gardens to get them ready for the winter months, including tree pruning and removal. Investing the time and proper preparation when laying new sod on your property is well worth the effort according to Foster Lawn and Garden in Barrie.